Wastewater treatment – Turbinate International B.V. The contaminated pigging water is lead through a rough strainer (5mm) stranding into the settling tank on our TSC-Unit. From this tank the remaining water is lead through a stand-pipe to the process drain of the refinery. Only the contaminated water is led towards the sewer, the other water is reused. At the end of the job the coke settlement can be removed from our TSC-Unit with one of the clients vacuum trucks. 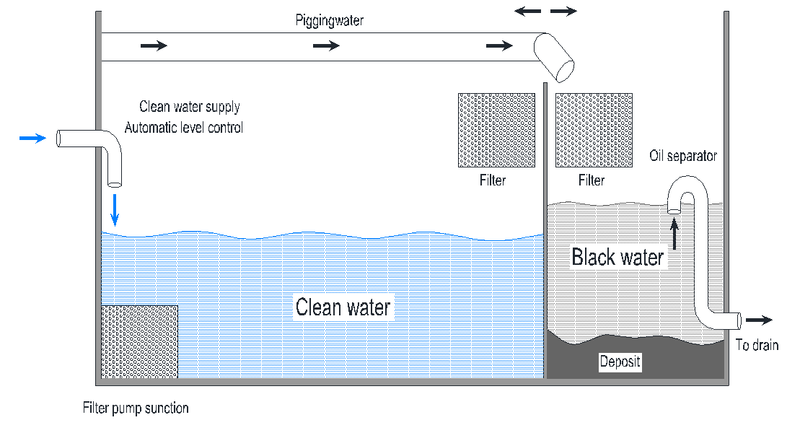 If desired, Turbinate can provide an extra filter installation ( 50 micron) allowing us to reuse even more pigging water.